DEAR GAYLE: Use vinegar and salt. 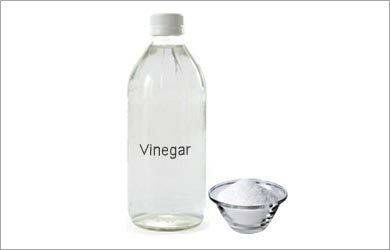 Place the bracelets into a container filled with vinegar and about 1 teaspoon salt. Let soak. You can use a toothbrush for any stubborn areas. Rinse them with water, and pat dry with a cloth. I’ve heard people mention that they’ve used ketchup or lemon juice. I tried it and didn’t get positive results without scrubbing. Both are more expensive than vinegar, too. DEAR TINA: Scrape off as much of the crayon as you can. I’ve used toothpicks and a lot of patience. Vacuum the scrapings from the fabric, and try a product called Goo Gone. According to the manufacturers of Goo Gone (www.googone.com), their product isn’t flammable. DEAR KRISTINE: This recipe was shared by a reader, and it’s absolutely delicious. DEAR TRACEY: You can add it to meatloaf, meatballs or soup. You could make fried rice, too. If you don’t have any leftover meat, just fry the rice in a pan, scramble in an egg and add some vegetables and soy sauce. Try rice pudding as a treat. It won’t seem as if you’re eating leftover rice because it’s a dessert instead of a meal. It can be served warm or cold. In a saucepan, add all the ingredients to the cooked rice except the cinnamon and nuts, and bring to a boil. Lower heat and simmer until most of the milk is absorbed. Add cinnamon and chopped nuts. Serve hot or cold.